This is a further venture under the auspices of the Kagyu Monlam team’s Compassion in Action initiative. The camp began on 26th January, 2019 and will run until 4th February, 2019. Over ten days, the camp will perform hundreds of ABC-AR (Animal Birth Control Anti Rabies) surgeries on the street dogs in Bodhgaya; run school education programmes; offer an outpatients department outside the Kagyu Monlam Pavillion for local people who want to bring their livestock or pets for treatments; and send a team of vets and para-vets out to rural villages in the Gaya district to treat all the village animals and teach farmers about proper management and health care of their animals. 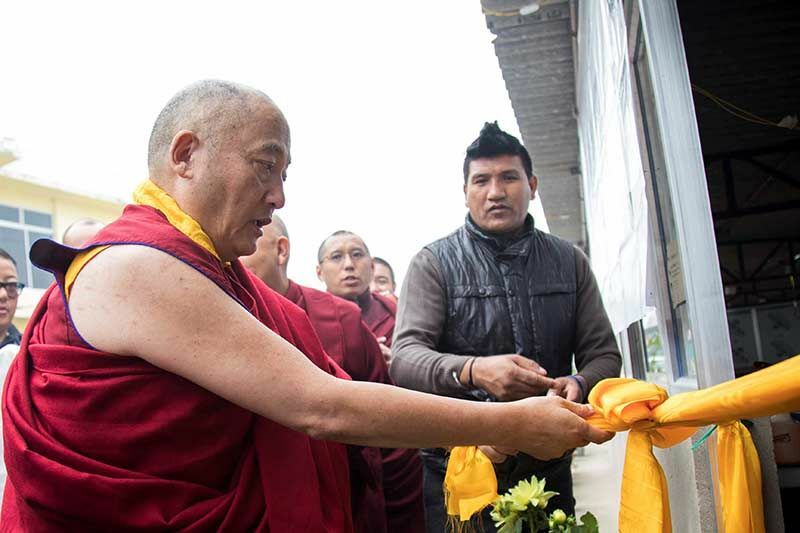 This year the main camp on-site has been housed in the new medical facility behind the Monlam Pavillion, the location of Sorig Tibetan Medical Camp during the Kagyu Monlam. One building houses the surgery, a separate building has the recovery area. Buddha Shakyamuni had compassion for all sentient beings equally, not more for one being over another, all were equal in his compassion. All sentient beings have a lot of suffering and sickness, so to help relieve the sickness brings great merit and is wonderful. The purpose of the Kagyu Monlam is to alleviate the suffering of all beings. This is also the wish of His Holiness the Karmapa. 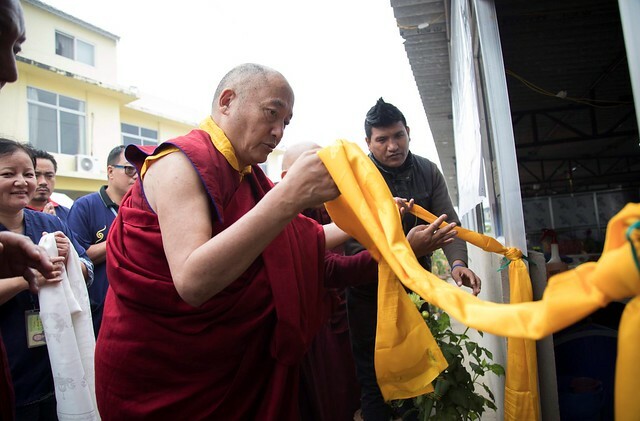 So if we are able to alleviate the suffering of dogs, cats, cows and other animals through this animal camp, it is in accordance with the wishes of both His Holiness and the Kagyu Monlam in general. Before, in Tibet, there was the practice of treating animals. If an operation or surgery needed to be done, they did it, but it was nothing in comparison to the West where the medical facilities and treatment for animals is much superior. At the time of the 15th Karmapa, he had three main disciples, and one,called Lingchen Sangpo Gomchen, was a doctor. He used to treat animals, for example fixing a yak’s broken leg and other problems. Obviously, in the west the treatments are better than Lingchen Gomchen could have done so it is really great we can bring these methods to India. Whatever benefit we do for other sentient beings, we say we are able to undertake those activities due to the power, blessings and aspirations of the Buddha. So it is the same for this camp, if we can benefit any beings it is due to the aspirations and prayers of the Buddha. So please carry on your work and thank you. I will pray that we will have a fruitful and beneficial program that will grow and will benefit many beings. 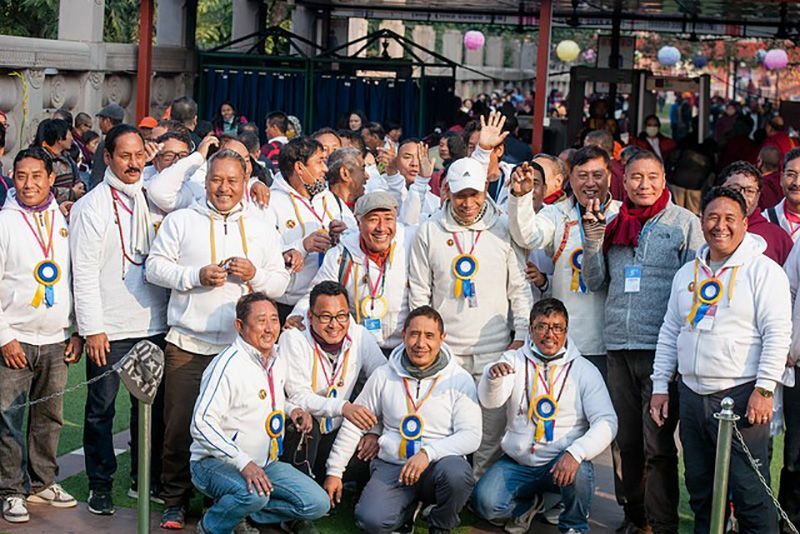 This year’s team comprises four vets and eight para-vets from SARAH, the unit from the Sikkim Animal Husbandry department who have run the animal camp since its inception in 2014; a vet from Dharamsala Animal Rescue; three volunteer vets from Australia; and a para-vet from the local NGO, Dogs of Gaya. The programme is funded jointly by the Kagyupa International Monlam Trust and the Brigitte Bardot Foundation. This year Brigitte Auloy, who is in charge of international operations at Brigitte Bardot Foundation, will be at the camp, observing the work it does. 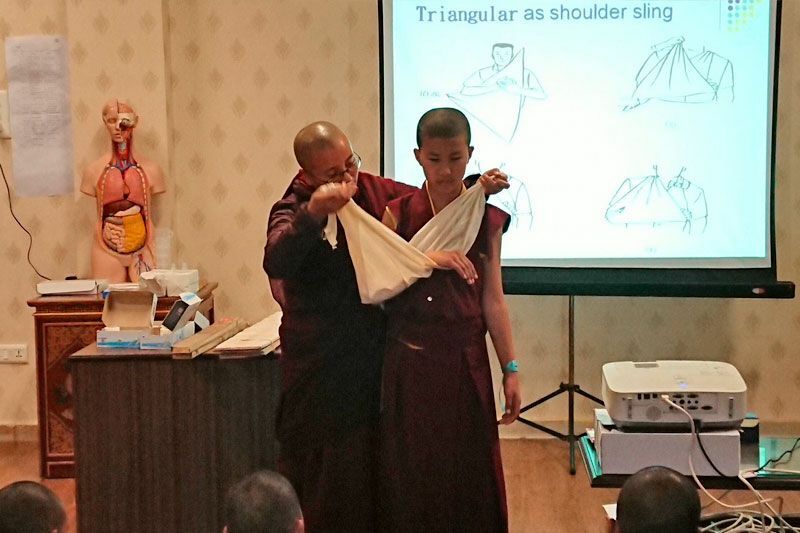 twelve nuns from six different Kagyu Nunneries, who are attending Arya Kshema, will train in animal first aid, rabies control, treating skin wounds, giving injections, and dog handling. They will return to their nunneries and become the animal first aid officers for their area. On completion of their training, they will be given a big first- aid box full of medicines, bandaging materials and equipment they need for this important job. 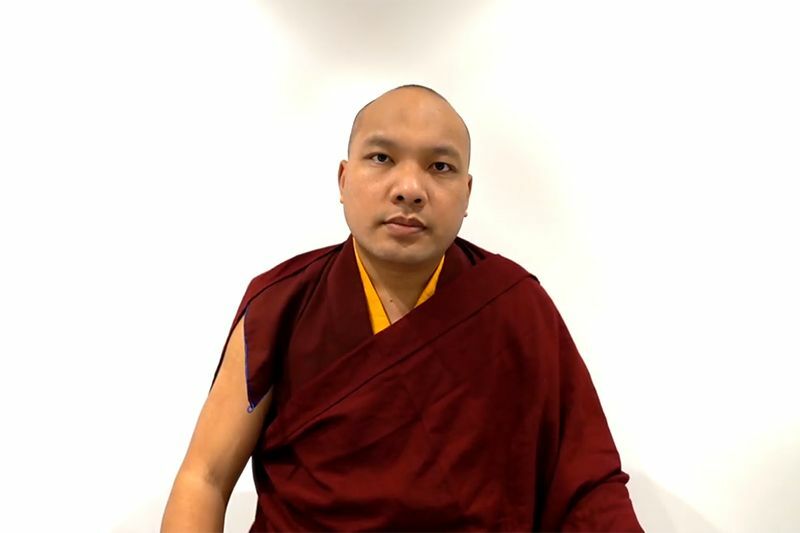 This initiative is especially according to the wishes of the Karmapa, who wanted the nuns to have equal opportunity with the monks in this training. Work started immediately. On the very first day of the camp, 31dogs were surgically sterilised, and the Out Patients Department, which deals with animals brought in by local villagers, both domestic pets and livestock, treated 100 patients. The village outreach team treated 270 animals. Recorded during the 36th Kagyu Monlam, Bodhgaya, India. January 14-17, 2019. 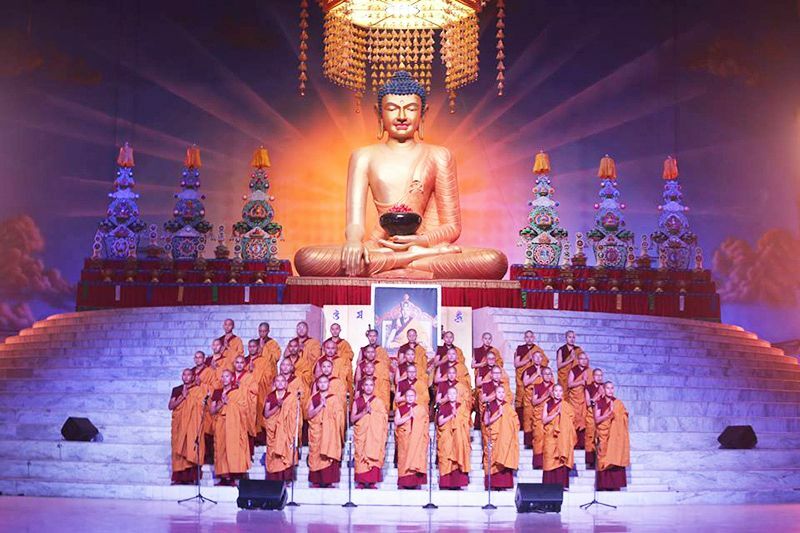 Recorded during the 36th Kagyu Monlam, Bodhgaya, India. January 9-11, 2019.